Emperor Tiberius, who reigned from 14 AD to 37 AD, appointed Pontius Pilate as governor of Judea in 26 AD. Pilate began his career in Caesarea Maritima, the Roman capital of Judea, and later moved to Jerusalem. He ruled as governor of Judea from 26 AD to 36 AD. Pilate is best known as the Roman Governor who ordered Jesus Christ’s execution. In 1961, archaeologists discovered a plaque fragment at Caesarea Maritima. The plaque was written in Latin and embedded in a section of steps leading to Caesarea’s Amphitheatre. 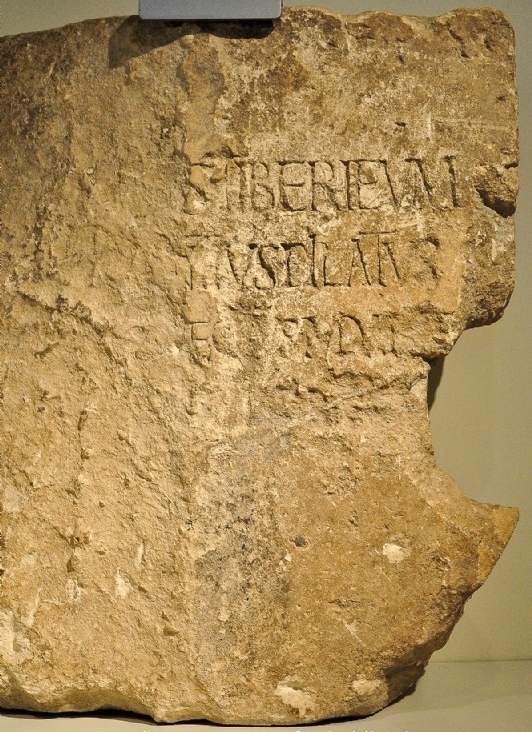 "Pontius Pilate, the prefect of Judaea, (erected) a (building dedicated) to (the emperor) Tiberius"
This artifact located at Caesarea’s theater is a replica of the original now housed in the Israel Museum in Jerusalem. This is the only known occurrence of the name Pontius Pilate in any ancient inscription. The significance of this archeological finding, along with extrabiblical textual evidence, is that Pontius Pilate is a true historical figure whom the Bible mentions 54 times as the governor who presided over Jesus’ last day.